Meeting former US president Bill Clinton and others who share his passion for youth leadership and community service has left a deep and lasting impression on Alyssa Ong, who is inspired to make her own mark on the world. Having twice participated in the Clinton Global Initiative University (CGIU) as a representative of INTI in 2011 and the University of Kansas (KU) in 2013, Alyssa was among some of the world’s brightest college and university students brought to discuss solutions to pressing global issues. Her initial participation in CGIU, a forum to educate and motivate young people to make a positive impact in the world, was made possible through INTI’s partnership with Laureate International Universities. 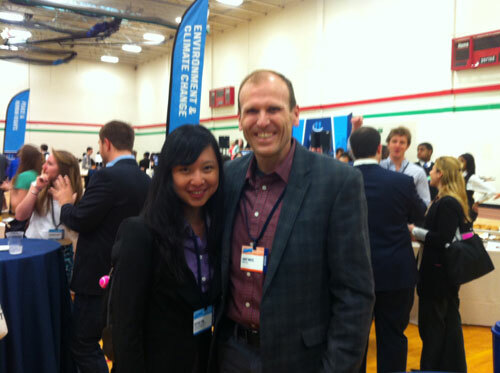 “The passion and commitment displayed by everyone at CGIU and the support I received at INTI have been inspirational. I am motivated to carry out my commitment to action on a larger scale and this has extended from INTI to KU and beyond. My take away is students, not just adults and professionals, have the ability to make the world a better place; all we need is an idea, the commitment to action, and the belief that it is possible,” said Alyssa, who was recently awarded by KU for her research on Alternative Breaks, a life-changing students’ programme on volunteering and social responsibility. Presented KU’s Undergraduate Research Award (UGRA) for her project entitled Alternative Breaks: Their Impact on Students’ Perceptions, Attitudes and Behaviors, Alyssa, who majors in Finance and Accounting at KU, studied behavioral changes that resulted from participation in Alternative Breaks, a programme that gave students a chance to travel and do volunteer work around the US, and compared them with changes in students who engaged in other activities over college breaks. The UGRA programme has been around for over 20 years, and is offered to students who propose solid research projects under the university. Proposals are selected on the quality of the applicant’s proposal, the applicant’s academic record, and also on the endorsement from a faculty member who is familiar with the applicant and the proposed project. As the first research and statistics analyst for Alternative Breaks at KU Alyssa had over 600 students as subjects for her study of over four months. Chief among the sources of inspiration for INTI’s students for community service and social responsibility is President Bill Clinton, who serves as the Honorary Chancellor of the Laureate International Universities network, a role in which he offers advice on social responsibility, youth leadership and increasing access to higher education. In his 2010 visit to INTI International University, he addressed more than 1,000 students and invited guests and inspired many others. Since then, INTI’s students have participated in global events such as the CGIU, which brings together students from all over the world to serve the community. Students at INTI are also able to learn from top global leaders discussing issues affecting the world today through cutting edge events such as the World Business Forum and Clinton Global Initiative. In addition, they have access to international faculty, overseas guest lecturers and study tours to INTI’s partner universities in other countries. These and more provide students access to an international learning experience beyond Malaysia as part of their studies and as part of their world class education at local prices.